Visit the UNESCO-IHP IIWQ World Water Quality Portal and discover the extensive word-wide water quality dataset. Read more on state-of-the-art Earth Observation solutions by the world’s leading company in aquatic remote sensing. All you need to know about the launch of the UNESCO-IHP IIWQ World Water Quality Portal. 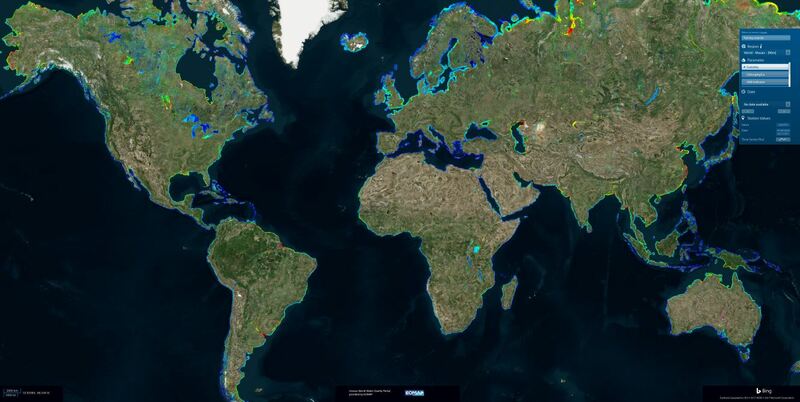 EOMAP GmbH & Co.KG has built the world’s first global water quality portal to support the International Initiative on Water Quality (IIWQ) of UNESCO’s International Hydrological Programme (IHP). The comprehensive IIWQ World Water Quality Portal will assist with global water quality assessment and capacity building for streams, lakes and rivers. The launch will take place at UNESCO Headquarters on 22 January 2018 and an exhibition on “Satellite-based Water Quality Monitoring” will be available from 22-26 January 2018. For more information, please download the full press release and World Water Quality Portal Flyer.